Appearance: The symbol for the west was portrayed in two fashions. The first was a standard topped with a feather and a falcon. Tohe second was a round-topped pole with only the feather. The first symbol was used until about the 12th Dynasty. The second was first used in the 6th Dynasty and eventually replaced the earlier symbol. The symbol was portrayed in Egyptian art in various degrees of personification. Sometimes the symbol had arms which would embrace a deceased person. Occasionally the symbol was shown as a woman with the sign on her head or with the sign as her head. Meaning: The symbol for the west may be derive from the feathered headdresses of the peoples of the western desert. 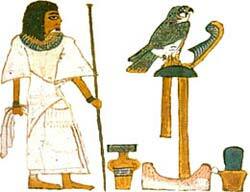 The falcon is probably a symbol of the sun god (Horus or Re) who sat in the west. For the ancient Egyptians, the west (specifically the desert west of the Nile) was the destination of the dead. This is because the sun died every day in the western horizon, only to be reborn the next morning in the east. Most Egyptians were buried to the west of the Nile with their heads facing the west. The "Goddess of the West" (a woman shown with the hieroglyph of the West on her head) would receive the blessed dead in the afterlife. This goddess was originally developed as a persona of Hathor, who also occasionally wears the glyph on her head. In the image to the left, the blessed deceased is shown heading towards the western mountains where there is plenty of food and drink (the glyphs for "food" and "drink" are on either side of the "mountain" glyph).